Bulkhead Repair by Everlast — Repairs That Last! When considering bulkhead repair, we advise you start by getting the opinion of a professional. You don’t want to spend a great deal of money on a quick fix, only to have to repeat the process in another area soon afterward. We will offer you expert advice on the best remedy for the problem. Let us evaluate your situation before it becomes an emergency. When it comes to bulkhead repairs, it pays to do it right the first time. When it’s time to repair your bulkhead, get started as soon as possible. Procrastination can lead to major erosion of property as the issue will continuously worsen. If that happens, your vulnerability to storms and high tides will increase. Eventually, total collapse may take place with catastrophic results. 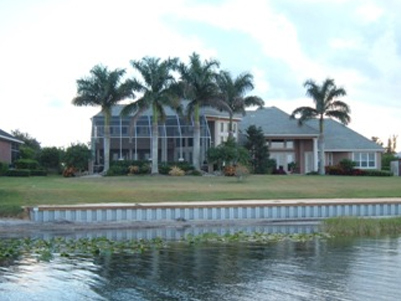 We are experts in bulkhead repairs and will inspect your entire waterfront for any other areas requiring remediation. We can make recommendations as to the best course of action. This type of construction is subject to decay, borers, which are tunneling creatures that feast on submerged timber, and just plain wearing away from the constant motion of water and sand. When these walls begin to collapse, complete replacement with a superior material like co-extruded vinyl is usually the best solution. Repairs to wood must be repeated and will become a frustration — like shoveling sand against the tide. Concrete contains iron rebar that begins to rust and eventually loses its reinforcement capability. Concrete will begin to crack and give way from the pressure of the land. Patching concrete below the water does not work. Entire sections must be replaced. Other sections will soon follow. Replacement with a superior and more attractive material, like vinyl, is the best option in most cases. Once steel begins to rust — and becomes unsightly and weak — there is no reversing the process. Like steel, the corrosion to aluminum is irreversible. Contrary to popular belief, aluminum breaks down with repeated exposure to salt water due to a chemical reaction caused by minerals in the water. Bulkhead repair is not always the solution to the problem, and is often a Band-Aid on a critical wound. The repaired area may hold up for a year or two, but another area of the wall is likely to degrade later. It becomes an ongoing maintenance issue that will eventually lead to futility. If your wall is relatively new and was damaged by a specific isolated event, repair might be called for. We as experts in marine engineering and application are best qualified to make that determination. When you need bulkhead repair, contact us first. One of our engineers will meet with you to analyze your individual situation. He will also show you the latest in co-extruded sheet vinyl products that have a 50 year warranty to protect your property. He will perform a soil analysis and an engineering evaluation of your current bulkhead. Changes in the general lay of the land along the waterfront can make a difference in the adequacy of a structure built many years ago. Loss of wetlands has caused higher tides in many areas; a barrier constructed 20 years ago may no longer offer adequate protection. Why repair something if it is due to fail? The best bulkhead repair alternative is a co-extruded, interlocking, vinyl sheet product. These panels are made from an ultra UV-resistant cap layer that is applied to an extra strong and resilient vinyl layer. This produces a colorfast, extremely attractive product that can be driven deep and then capped to provide a bulkhead of everlasting beauty and superior strength. It will not corrode, decay, fade, crack or change in any way – and it is guaranteed for 50 years. Let us show you the best options before you consider sinking money into a declining structure. Everlast Synthetic Products manufactures and installs bulkheads and many other marine products across the entire US and worldwide. For bulkhead repairs that last, call us today at 1-800-687-0036! Don’t allow your valuable waterfront property to be at risk.